Eliza Conway-Staithes Arts and Crafts Centre. My name is Eliza Conway and I am a retired teacher which means I can devote my time to textiles. I have been a member of the Staithes Arts and Crafts since 2003. 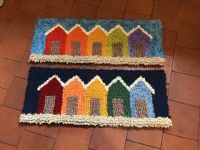 I make rag rugs using old woollen blankets or wool yarn. I sell carpet wool at 50p per ball and it is very popular. If you have bought some and would like more please email me and it can be posted to you. I also enjoy knitting small animals and gifts. Yarndale (Skipton, Yorkshire in September). At these shows I sell the carpet wool, cones of wool, rugs plus vintage textile treasures collected far and wide.